Super Hero Boy: Just a little shelter from a chaotic mom schedule! Just a little shelter from a chaotic mom schedule! You might remember my review of the BusyBodyBook last year. That same BusyBodyBook is still sitting on my desk as we speak and I use it daily to keep track of my school assignments, blog posts, doctor appointments, and even our family get togethers (which lately are quite often) . The weekly grid layout of the BusyBodyBook continues to be one of the most useful layouts you will find in a mom friendly organizer. With five separate columns to fill out you customize your BusyBodyBook any way you please. I currently use my five spaces for my : daily events including birthdays, doctors appointments, errands to do, blog posts due, and the last one is the wish list of things I would like to get done. I only wish I actually finished that last column more often. One of my biggest complains last year was with the cover of the BusyBodyBook. The design of the book itself is similar to a spiral notebook and though I prefer it bound that way as you can fold it over to see just the page you want, if you are constantly dragging it in and out of your diaper bag (or school bag in my case) the cover gets pretty worn fairly fast. Well the 2009 edition added a great super thick new see through cover on the front and back of the book which will protect your BusyBodyBook from the wear and tear of daily life. Otherwise the design is exactly the same, which we have no complaints with as I absolutely love the layout of the inside of the BusyBodyBook. You can get your own BusyBodyBook directly from their website or on Amazon! 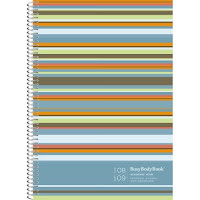 BusyBodyBook is giving two of our readers their own BusyBodyBook in their color choice! Leave a comment on this post. Head on over to BusyBodyBook and tell me which book you would choose if you won! This contest will end July 11th at midnight! Although the polka dots are fun, I love the striped one that you've shown the best. I lurve me some stripes. I LOVE this idea - it would make my life so much more organized! I would choose the Dots, Aug-Sep book. but I'd get the stripes one! I like Floral. Very pretty. I love the Floral Busy Body book, although all the designs are great. I'd love to win the Weekly Grid Busy Body Book Aug '08 to Sept '09 in the stripes! This would be so useful now that I'm working from home! I love that Grid Fridge calendar. I would so use that! I also love the green dotted planner. All their stuff is da BOMB! Thank you for this giveaway. I would choose the Mosaic book. I could really use help with getting organized. This is a great idea. Thanks. until this year I used to get by on post it notes posted everywhere. now I can't live with out my planner, this book looks great! i love the floral, but the dots is great too, i wouldn't need anything til next year. great contest! If I were lucky enough to win I would definitely choose the Retro Dots Busy Body book...so cute and busy looking. I like the Aug 08 to Sep 09 Dots. I've been wanting one of these, I hinted to my hubby for it as a bday gift. Thanks so much for the opportunity. I would choose the Jan-Dec 2009 Mosaic. Thank you for the contest. The floral is so pretty! Thanks for the great giveaway! The polka dot one is super cute! I love organization! I also subscribe to your posts! I love the mosaic version. The pattern is fantastic. The Funky Flora Busy Body Book is our fave! I would like the dots organizer. Wow, I could use this. Love the stripes. The organization and layout sounds terrific; with 5 different columns. That's part of the reason I don't like traditional calendars, because things should have their own categories. I would love to begin the new year with a mosaic BusyBodyBook and throw away all those scraps with notes saying "get a calendar". Seven Dogs and A Baby in my sidebar! I really like the Retro Dots for this year, or the Floral for next. I could really use one of these! I would choose the Mosaic book. It would definitely help in keeping my family life organized. love to win the Weekly Grid Busy Body Book Aug '08 to Sept '09 in the stripes! the floral book is my choice. with seven children, a homeschool schdule, a self employed hubby etc i could use an organizer and all i have is a huge household binder- not easy to take along with me! i added you to my sidebar- on the left! The floral design is nice thats the one I would pick. I am excited because now I am subscribed to the blog! Busy Body. It just looks cute and helpful. Mosaic. Thank you for this nice giveaway. Busy Body. This would be great for my daughter who is in 10th grade. They're all cute, but I'd go with the floral design!!! the weekly fridge grid pad has gotta be my favorite- between nursing school and my job- and my dhs two jobs and our 2 year old- its tough to coordinate! I like the Floral, great design! I would choose the Aug-sep book in stripes. I have three kids and a a full time job. Between keeping track of my schedule and theirs, I always miss something. Having a place to write it all down together would be handy. I love the dots! Thank you! I would love to have the Jan-Dec 09 Floral BBB. I have a BBB in the past and they are the only planners I would buy! I SOOOOOO need one of these! My husband and I were just talking about how badly we need to put together a family calendar. I really like the dots book and with it starting in August that would be perfect! Thanks for the opportunity! I love the stripes! I'd choose that one. I would choose the Mosaic Weekly Grid. Thanks for hosting the giveaway! I think the Weekly Fridge grid could help save me alot of aggravation in the future! the august 08- september 09 in retro dots is lovely! Perfect! I was just telling my husband the other day I need to get a book like this, I had one four years ago and that was the MOST organized and stress-free time of my life! I would choose the Mosiac, thank you so much! The retro dots...green's my favorite color. Thanks! I love the polda dots August '08 - September'09 book. These books are the best! The polka dots from the August-September one is adorable! I would love the stripes (Aug-Sept) for when my 3 kids return to school and my lazy summertime is over! the jan-dec floral is so pretty. I really need this in my life. so many places to go with the hubby and 2 kids. I'm not the only mama juggling school? Keep at it, we'll be done before we know it! I love the Funky Floral Busy Body planner. I would get the blue stripes, I love it! Thanks! My daughter loves polka dots. So, I would choose that one. Thanks for the chance to win!! I like the stripes, that's the one i'd pick! I would pick the '09 Mosaic style. This looks wonderful! Thank you! guessing dots, wife not here to ask.. I think I would have to pick the Mosaic. Definitely have to get the fridge grid pad to keep up organized. I need to be more organized. I would choose the floral, jan to dec. I love the polka dots and the green background. What a great contest. The polka dots look great to me! Thanks!! If I win, Iwould like to get the Weekly Grid Journal in Floral. Thanks for the contest. The '08-'09 Stripes book would be nice! Thanks for the contest! I like the mosaic, jan-dec 09 design. The Weekly Grid from Aug-Sept. is PERFECT in stripes. I like the stripes best! I really like the Floral January to December pattern. Busy Body. Thanks so much for the giveaway! August-Sep 09 Dots. Our house caught on fire a few months ago and our calendar burned along with it, so I'm sort of lost now without one... of course most places aren't still selling 2008 calendars. I really like the look of the Busybody book... I'm a homeschool teacher so I'm in the process of making the lesson plans for the next year, this would help me coordinate when to get supplies! I love the striped one that you've shown the best. I love the Funky Floral book!